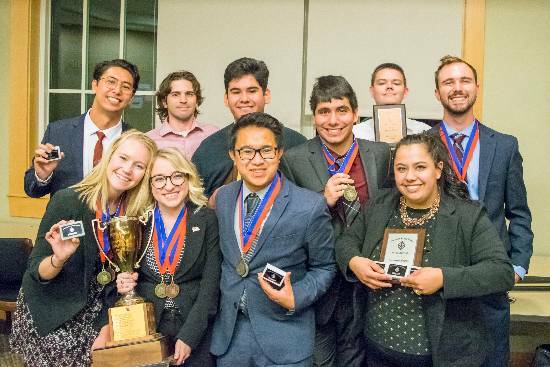 The Modesto Junior College Intercollegiate Forensics team (aka The MJC Speech and Debate team), is a co-curricular activity and Communication Studies course sponsored by the Department of Communication Studies and and the Arts, Humanities, and Communication Division. Participation is open to any student enrolled at MJC. The team travels a variety of intercollegiate tournaments each academic year. MJC competes in Parliamentary (NPDA) and Lincoln-Douglas (NFA-LD) style debate, as well as a full range of individual events (Persuasion, Informative, After Dinner Speaking, Communication Analysis, Prose, Poetry, Drama, Program Oral Interp, Duo, Readers Theater, Impromptu, Extemp). More information about the events we compete in can be found here. Intercollegiate Forensics is offered each semester and can be repeated up to 4 times. Interested students can enroll in COMM 105 or click here to contact us for more information. You can also come by Founders Hall 220M and talk to either of our full time coaches: Ryan Guy and Taure Shimp. For information about the MJC Speech Night click here.